This year marks the 10th anniversary of Michigan’s tourism promotion campaign known as Pure Michigan. It was in May of 2006 when the first taxpayer-funded commercials ran featuring voiceovers by popular Michigan actor Tim Allen. [*] Similar commercials hit national media in 2009. [†] Over that time, the state has spent $261 million on efforts to promote the Michigan “brand” and make the state a travel destination. No matter the popularity of these types of programs, taxpayers and policymakers should ask how effective this spending is. This money could potentially be put to more effective use that would generate better economic returns for state residents, such as for improved roads, public infrastructure or even an across-the-board reduction in Michigan’s personal income tax. The aim of this study is to assess the effectiveness of state-funded tourism promotion. This type of analysis is necessary because the state’s effort to measure the effectiveness of the Pure Michigan program is inadequate. Each year the Michigan Economic Development Corporation, the state’s main economic development operative, contracts with a company to produce a report analyzing the economic returns of its taxpayer-funded tourism promotion effort. And each year, this company reports an enormous "return on investment" from this spending. But there are several reasons to view these findings with skepticism. The MEDC has an incentive to puff up its claims of success. The very survival of the department — and the jobs of its employees — relies on the appearance that its efforts create more employment and wealth for Michigan residents. In fact, when determining which firm to hire to conduct an analysis of its tourism promotion program, MEDC correspondence indicates that department officials purposely sought out a firm that would help justify spending on tourism promotion. To generate a “return on investment” figure for its tourism promotion program, the MEDC uses Longwoods International. The MEDC has hired this company for several consecutive years on a no-bid basis. Longwoods’ analysis of the 2015 Pure Michigan advertising campaign claims that for every $1 invested in out-of-state advertising, the state collects $7.67 in new taxes. This is up from a $6.87 return for the 2014 campaign. In fact, the ROI for Pure Michigan spending, according to Longwoods, has steadily increased for nine consecutive years, growing from $2.11 in 2006 to $7.67 in 2015, a 264 percent increase. [‡] It’s as if there’s no limit to the investment return of state-funded tourism advertising. Unfortunately, the work that Longwoods does for the state is not subject to any type of review or third-party validation, largely because Longwoods maintains that its method for deriving these ROI figures is proprietary. That is, it is kept hidden from the public despite the fact that taxpayers pay north of $100,000 every year for this analysis and this analysis aims to inform public policy. Because the paid-for results of the MEDC are unverifiable, this current study provides a different type of analysis of state-funded tourism promotion, and attempts to do so in a fully transparent manner. It uses a statistical model constructed after a thorough review of other academic research on the subject. The statistical equation used in this study tries to isolate the impact of state tourism spending on the industries most likely to benefit from it. These include hotels and accommodations, amusement and recreation, and arts and entertainment. Where possible, it examines whether or not tourism promotion spending impacted economic activity in each industry and the incomes of the workers in those industries too. These sectors do not capture the entirety of the potential economic impact of taxpayer-funded state tourism promotion, but they are the sectors most likely to benefit. The impact to all other sectors of this spending is likely to be less. In other words, if tourism promotion spending produces large impacts in these sectors, it’s possible that it has an overall positive effect on the general economy. If, on the other hand, a large impact cannot be found in these sectors, it is unlikely that this spending produces meaningful benefits in other sectors or for the economy as a whole. The results of this econometric analysis, based on data from 48 contiguous states over a 39-year period, find only a small positive impact of state-funded tourism promotion on the hotels and accommodations industry, no impact on amusement and recreation, and a microscopic one on arts and entertainment incomes. In all cases, the net results — after subtracting out government promotion costs — were negative. The Michigan-specific results did not vary from these national averages. Based on these results and the failure of the MEDC to provide verifiable evidence on the effectiveness of taxpayer-funded tourism promotion spending, the Legislature should stop allocating money for the purpose of tourism promotion. State lawmakers have shuttered other failed economic development programs, such as the Michigan Economic Growth Authority and the Michigan film incentive program, and it should do the same with Pure Michigan. Short of its elimination, the state Legislature should demand a new review of the evidence. 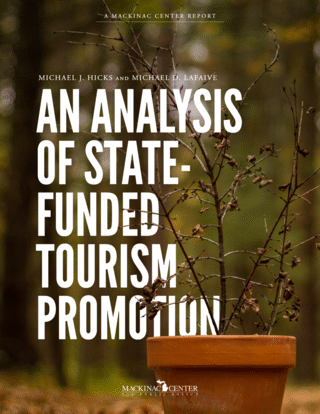 The analysis provided in this report suggests that state-funded tourism promotion is a net loser for states, including Michigan, whereas the MEDC-funded study based on a secret methodology shows wildly positive returns. In light of these two contrasting outcomes, the Legislature should commission a study, overseen by department other than the MEDC and contracted out via a robust competitive bidding process, to further study the economic impacts of spending on the Pure Michigan tourism promotion campaign. Additional spending on the program should be suspended until the Legislature can demonstrate with reliable and verifiable evidence that taxpayers are benefiting from this program. [*] Emily Guerrant, Michigan Economic Development Corporation, email correspondence with Michael LaFaive, Mackinac Center for Public Policy, Nov. 29, 2015. [†] For an example, see: “A Simple Sunrise” on Youtube.com at https://goo.gl/JP7VTq; Michelle Begnoche, “Zimmermann Named State Tourism Director of the Year,” Press Release (Lansing, Mich.: Michigan Economic Development Corporation, Aug. 29, 2011), https://perma.cc/4VES-X5VD. [‡] “Michigan 2015 Tourism Advertising Evaluation and Image Study” (Longwoods International, April 2016), 60, https://perma.cc/P85Q-RGYS.